Canadian cultivator Abcann whose name and symbol has since changed to Vivo (TSX.V:VIVO) was halted this afternoon at 12:40, then announced that they will be undertaking a cash and stock acquisition of Hope, BC based cultivator and online medical cannabis retailer Canna Farms. Abcann stock remains halted in advance of a conference call that Abcann will host tomorrow am at 9 EST to discuss the proposed deal. The Abcann offer for Canna Farms consists of 92.5 million ABcann shares and C$22 million in cash, for an estimated value of $133 million (using a VWAP of $1.20). It pairs one of only two Canadian pot companies operating at a net profit (the other is Aphria) with what appears to be a highly competent, vertically integrated LP generating impressive earnings (more on that below). 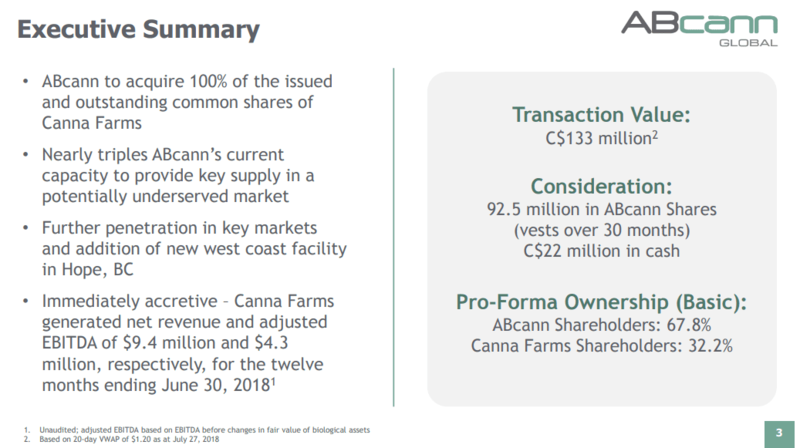 Summary slide from the ABcann Global investors presentation about the coming deal for Canna Farms. ABCN will hold a conference call about the deal tomorrow am. The resulting company will be a cultivator with 34,500 active square feet, and another 1.2 million square feet being built. The active outreach to medical patients is at a stage that it can begin to grow parabolicly, if word of mouth begins to take off amongst medical users. There’s a lot to like about this deal, and the limited information that we have on Canna Farms makes them look unique in a good way. The ACMPR licensed company cultivates marijuana out of a 20,000 square foot facility in Hope, BC, and sells it online in a way that we haven’t yet seen in this medical market. It’s an online e-retail store that appears to be available to clients with Canadian addresses and a valid prescription for medical cannabis who have registered with the company. The deck describes the combined company as having 15,000 patients, and our model lists ABCann at 2,000 patients, so Canna Farms implicitly showed up with 13,000 patients. Those patients are accessing a store that is unlike anything we’ve seen so far in the Canadian retail space. 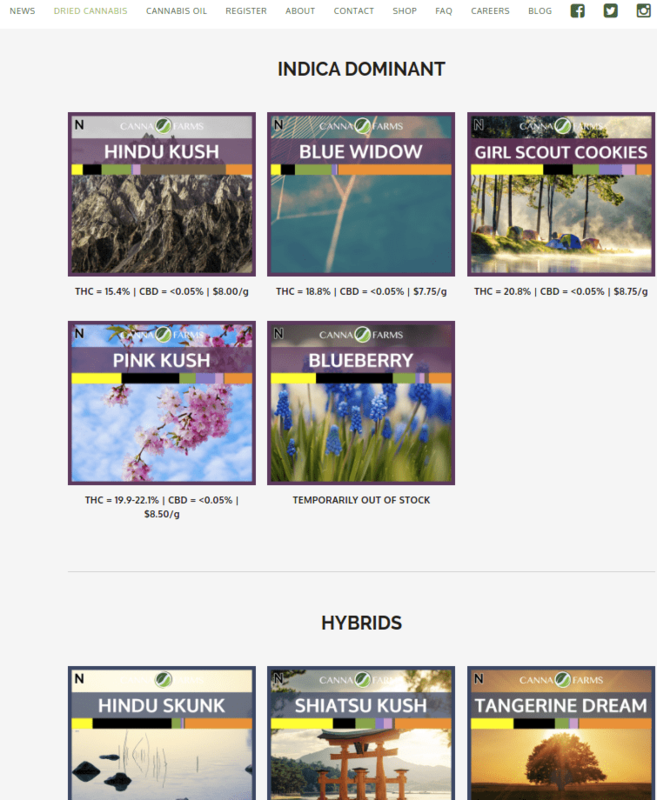 Various strains of dried bud and an assortment of oil products are available at decent prices in a simple catalogue system. It is possible that other LPs have this type of system visible only to registered patients, but we’ve yet to see it. Is Canna Farms the first vertically integrated cultivator with a sophisticated online catalogue? It’s worth noting that the online apparatus that appears to be working so well for Canna Farms in the medical space isn’t likely to be any use to retail cannabis users come October. The provinces are in control of the recreational market, and so far none of them have said that they would be allowing LPs to sell direct to consumers over the web. It looks from here like online sales will be exclusively medical weed to patients. In that context, look for some of these online medical sales to be cannabalized by retail dispensaries in October when the rec market goes live. Since Canna Farms is a private company, the deck that they have released ahead of the call contains most of what we know about their fundamentals. That deck reports that Canna Farms “…generated net revenue and adjusted EBITDA of $9.4 million and $4.3 million, respectively,” in the twelve months ending June 30, 2018. It’s tough to tell without the financials but we’re going to assume for the purpose of this post that “net revenue of $9.4 million” is the company’s total receipts less the charge/surplus that IFRS standards dictate they take for the fair value of their biological assets. The deck doesn’t tip Canna Farms’ facility size, but their website says it’s 20,000 square feet. To get an idea of facility efficiency, we usually divide the company’s unit sales by the square footage of their facility. 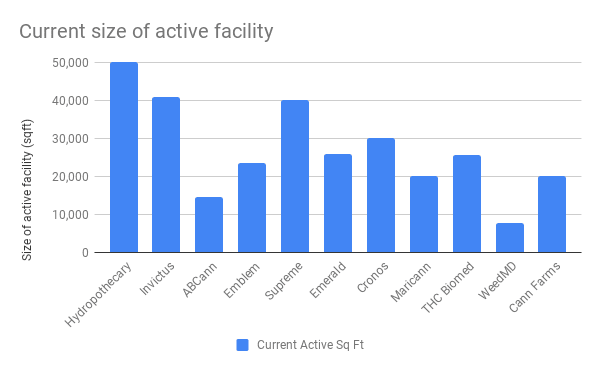 Since we don’t have Canna Farms’ unit sales, we’re going to compare them to peers of a similar size by looking at how much top line revenue they generate out of their facilities. IMPORTANT: We don’t have a full set of financials for Canna Farms, so these charts were created on a best-efforts basis. We’re working under the assumption that the data provided in the Abcann deck and gathered from the Canna Farms website is current and accurate. We’ve compared like periods where we’re able, and used the closest available period of equal duration when necessary. The company is generating revenue that is best in its class. As near as we can tell, this company grows its own weed and sells it all directly to patients. If that is the case, and all of this revenue comes from patient sales, they generated $626 per patient in the trailing twelve months; a believable figure. This appears to have been achieved through vertical integration; growing their own product and selling it directly to consumer. 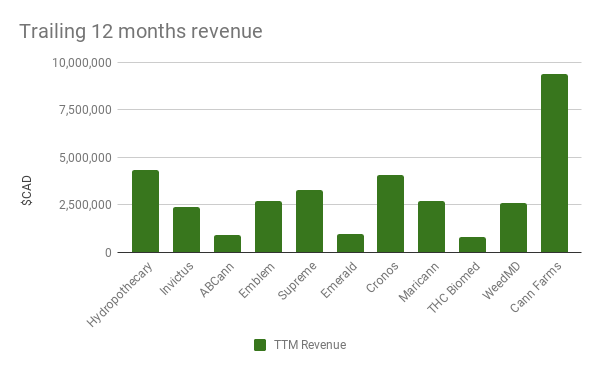 We’ll caution again that we don’t know at this point if the whole $9.4 million was earned from marijuana sales to patients, and also that the revenue figures for the peers in this graph contain revenue from other sources in some instances (for example, the Invictus revenue figure includes revenue from their interest in nutrient and hydroponics company Future Harvest). The prices on Canna Farms’ website are in line with the prices that are being reported by other LPs. So if Canna Farms’ $9.4 million in top-line revenue was generated from weed grown in a 20,000 square foot facility in Hope, the operation is showing class-leading efficiency. In keeping with the theme, we’re going to caution that this isn’t a perfect comparison. The size of these facilities changed over the year, and all of these companies are in growth phases, so they weren’t growing out of all of the square feet in all of the quarters. If these were unit sales, we’d be reminding you that many of these companies were selling weed to other LPs, and selling weed that they bought from other LPs to patients. 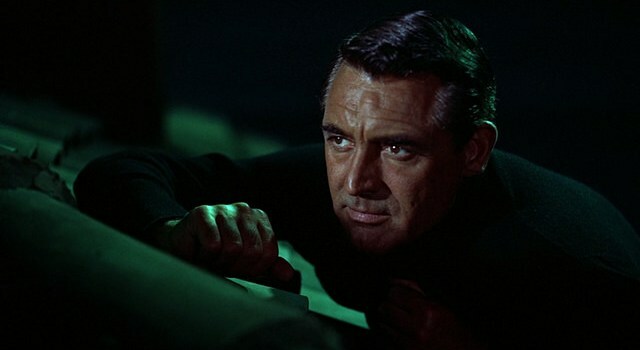 The nice thing about only having the revenue is that we don’t have to account for any of that. This can be looked at of the earning efficiency of these company’s total operations in relation to their active facility space. At $1.20, the resulting company will have a $224 million market cap, and $110 million in cash. Assuming Canna Farms has no debt, the enterprise value of the amalgamated company comes to $136 million. That’s only $33 million more than Invictus MD, $24 million more than WeedMD, and way under everyone else in this class. There is still a lot to learn here, including a properly calculated enterprise value, and we’ll do our best to learn it on the call tomorrow AM. Interested readers can tune in at 9 AM EST. It will be hosted via internet at www.abcannglobal.com or call in at 1-855-353-9183 and use the participant pass code: 45136#. 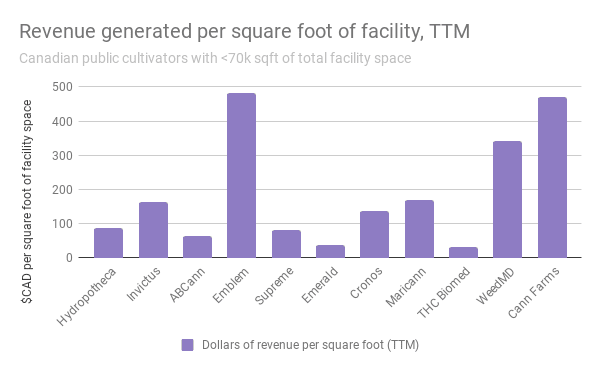 CORRECTION: A previous version of this blog post contained a version of the final graphic with the subheading “Canadian cultivators with >70k sqft of total facility space.” This was an error. The graphic shows Canadian cultivators with <70k sqft of total facility space.